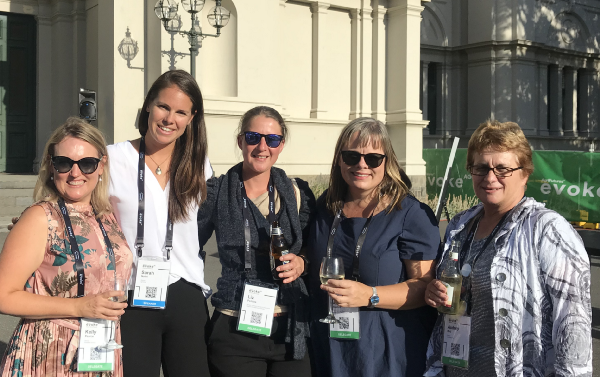 Sarah from AgThentic shared her insights from evokeAG that took place in Melbourne on 19-20 February 2019. Refer to original post here. “This week I was fortunate enough to head to Melbourne along with 1200+ others for the first (of what is likely going to be many) evokeAG event. It was a whirlwind of activity, with food trucks and coffee carts, edible insects and braindates, international delegations and world-class panels, virtual reality demonstrations, and of course startups. This is a common question (usually said like a complaint) at agtech conferences. I heard it a few times this week. But I disagree. I talked to cattle producers from the Northern Territory, mixed farmers from WA, broadacre croppers from all over NSW, chicken farmers, rice farmers, wool growers, and many more. I’m not saying that growers were the majority- they weren’t. Nor am I saying that the content was tailored to them- it wasn’t. But farmers did attend. And more importantly, the ones I talked to got a lot out of it. They learned about how VCs evaluate startups, browsed new products (some good, some great, and some not even close to ready), and even found investment opportunities. 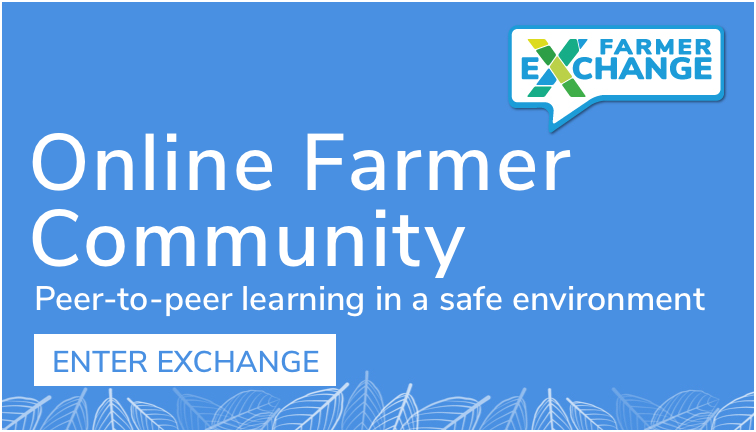 At the same time, the agtech community- myself included- got a lot out of connecting with them. It’s not every day that you get to speak with farmers from different industries who have self-selected for interest in ag innovation. 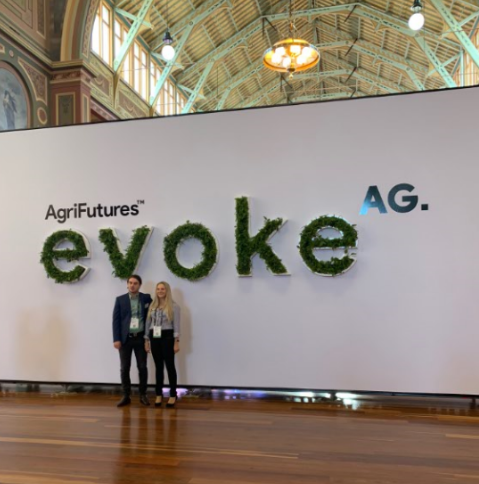 Hearing new perspectives and starting to build a common language around challenges and opportunities in agrifood tech is absolutely vital, and evokeAG certainly encouraged this. In their keynotes, both Arama Kukutai from Finistere Ventures and Michael Dean from AgFunder explained that many of the agtech sub-sectors (e.g., farm management software, irrigation IoT, etc.) are incredibly crowded. Investors I spoke with throughout the event echoed this sentiment, saying how frustrating it is to see copycat companies. The implication for startups here is to do your homework! Know what other companies exist globally in your space, and be able to explain clearly and simply how you’re different. We often talk about the dire need to attract new talent to agriculture, as well as equip the next generation with new skill sets. So I was encouraged by the many young people I spoke with at evokeAG who are passionate, talented, and hungry for jobs. What I appreciated most was how many of them approached me confidently and with really good questions, like: what do I need to do to get a job at an agtech company, what is working in VC like, and how can I build my personal brand in the ag industry even if I don’t know what job I want right now. These young people are ambitious, curious, and hungry for opportunities. We need to encourage more of this, as well as build pathways for young people to develop their skills and gain exposure to what working in ag or agtech is really like. evokeAG has started to do this by putting Future Young Leaders front and center on the main stage. These leaders are confident and determined, and they have a vision for what ag should look like. We need to embrace this momentum and continue our efforts to attract and retain talent throughout the year. As a high profile, well-attended and well-publicized event, evokeAG was sure to feature many exciting announcements. It did not disappoint. 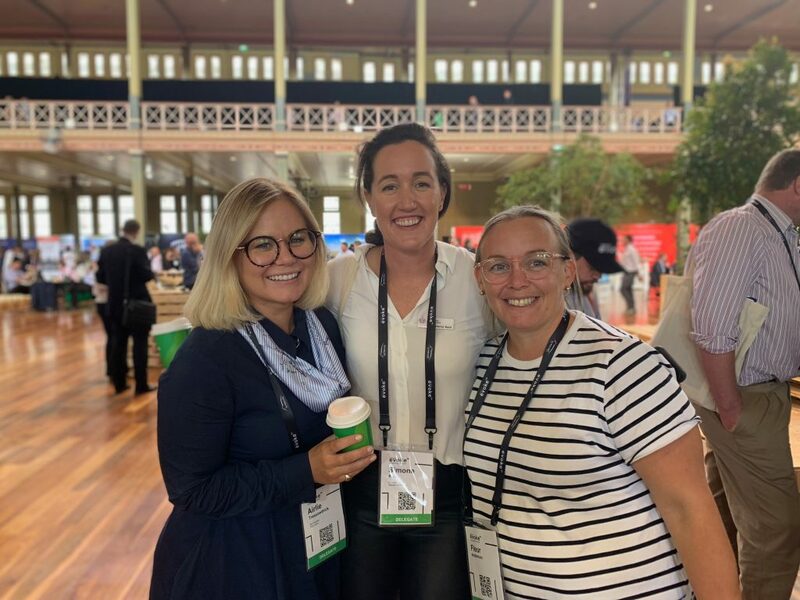 This is exciting, and I am thrilled about the momentum for and energy surrounding agrifood tech innovation in Australia and New Zealand, and the diverse range of players bringing forward new initiatives. The challenge with so many announcements is that it can be difficult to differentiate between initiatives and raises concerns as to whether we are really solving problems of fragmentation or just increasing them. These are all valid questions, but they aren’t ones that can be answered at evokeAG. My belief is that these initiatives and interventions are like startups: they succeed or fail based on execution, not press or ideas. So despite the amazing time I had this week, in addition to continuing to celebrate and share the launch of so many great opportunities, I’m excited to get home, put my head down, and get back to work on delivering results. As they say, the proof is in the pudding. Thanks so much for sharing with us, Sarah. 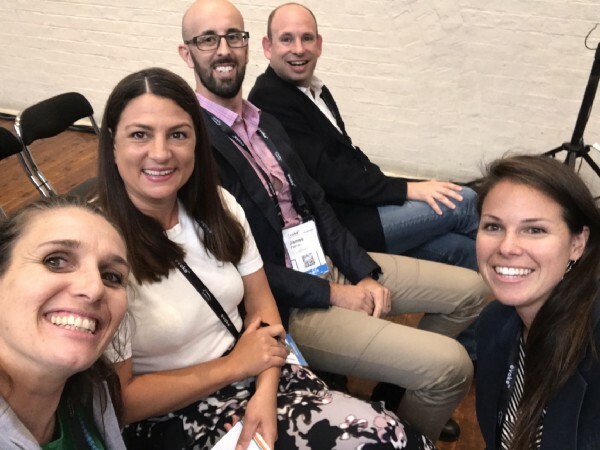 We also had the opportunity to attend the evokeAG Conference in Melbourne. 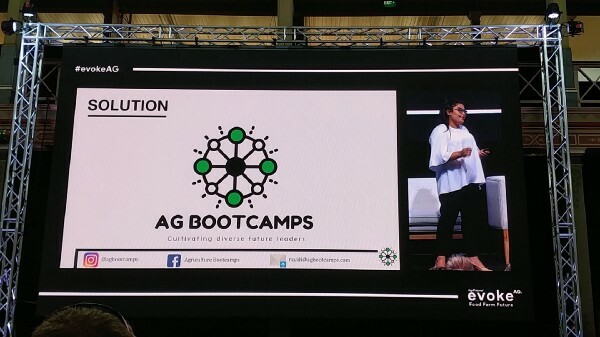 It was a world-class event that focused on people across the entire agtech ecosystem, from farmers through to startups, researchers, businesses, government and investors. Some great agtech solutions we encountered over the two days that may be of interest to our on-farm readers included: Agrinet (Farm Wide Wireless Networks), Flurosat (Crop health and nutrition analytics), Livestock Pricing (Livestock price discovery service), Saltbush Pellets, thingc (automating organic agriculture), FarmLab (soil and plant testing), and AgriAce (remote electric fence monitor and fault locator). 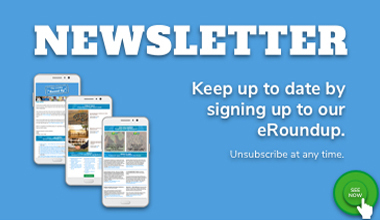 We can’t wait to offer you a much greater service for you to understand what there is on the market and how it can help you in your farm business. 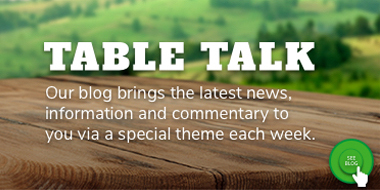 We also look forward to welcoming in businesses shortly to register with Farm Table for Business. Emma from @Agri_Digital questioning the equity model of #agtech accelerators. “The jury is out on some of these accelerators as to how effective they are and whether the taking of a significant equity position is the right one. Spencer Maughan, VC from Silicon Valley @finistereag: High potential in #aus #agtech. Big pieces that could be exciting but lagging behind rest of world in a pathetic way. And it’s not just ag. Future Young Leader Callan Daly: We need to think hard & hard about how we talk about ourselves & what we do. “We are JUST farmers”, “I’m JUST doing a degree in Ag Science degree”. We need to use language that smashes this subconscious lack of pride in farming. 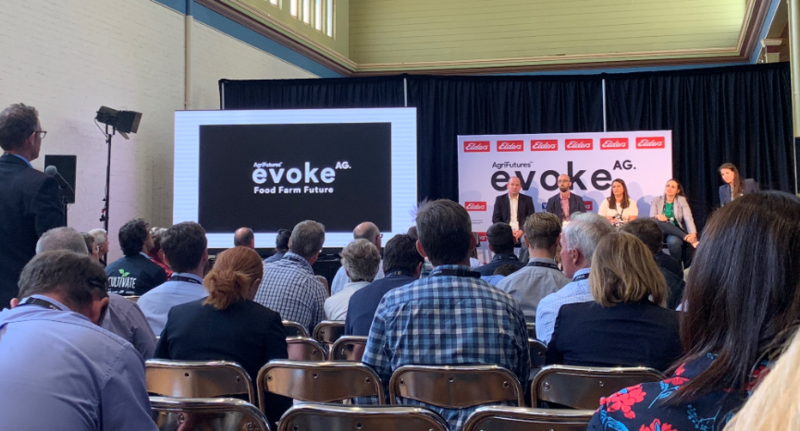 Natalie Engel, Sunlight Grazing, Producer Problem #pitchtent @evokeAG: We work way too hard for our beef to be undervalued, but assurance paperwork when truck ready to go takes over 2 hrs. Need one platform linking to all current quality assurance systems. Lisa from @SecureImpact on the @evokeag #pitchtent stage: There is no platform focused on solving the liquidity problem in agriculture. Presenting Secure Impact Marketplace, SecureX Exchange and the Digital ID title ownership. Steven Saunders of NZ @Robotics_Plus: Farmers don’t want 10 different apps to solve a problem. Collaboration and collective thinking to solve issues along different value chains is required. David Rosenberg of @AeroFarms – Vertical farming on a commercial level. | 95% less water, 0 pesticides, 390x productivity per square foot | And able to understand the plants better than anyone farming in the past through data analytics.